(This article was originally published in Poultry Digest December/January 2015). Rohde Farms at Tarlee in South Australia has installed the new Riva Selegg S151 model with auto vacuum and semi-auto egg packers. The Riva Selegg S151, with capacity of 15,000 eggs per hour, was supplied with semi-auto egg packing lanes, which enables operators to pack graded eggs into 30, 10 or 12 egg tray/cartons. 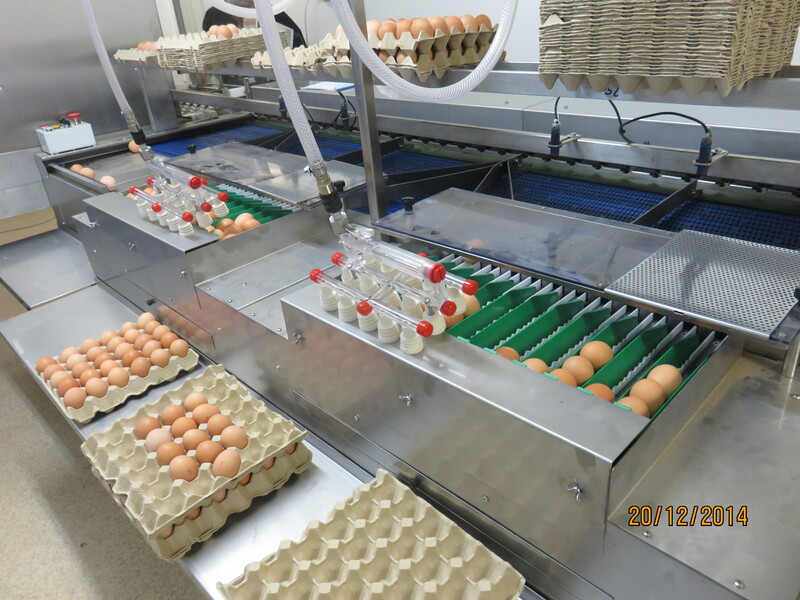 The semi-auto egg packers each have six lines of eggs, with 95-98% of all eggs being presented with air cell up. To change one of the semi-auto packers to have five lines of eggs (instead of six lines) it is very simple to just quickly and easily move a slide across. To pack eggs of the same grade into a 30 egg tray, you close one line of eggs and use the hand vacuum lifter for 15 eggs (3 x 5). To pack eggs of the same grade into a 10 egg box, you close one line of eggs and use hand vacuum lifter for 12 eggs (2 x 6). To pack eggs of the same grade into a 12 egg box, you open all six lines and use the hand vacuum lifter for 12 eggs (2 x 6). The S151 can be supplied with four semi-auto egg packers already assembled on the machine on the egg outfeed /collection table. The four semi-auto egg packers can easily be worked by just two operators positioned on the outfeed/packing table. Two operators working on the outfeed/packing table are capable of handling all eggs with no difficulties. Each operator handles two semi-auto egg packers plus one hand collecting table. Each operator is capable of packing up to 10,000 eggs per hour. The empty trays are stored on the tray shelf above the packing table. Once loaded by the operator, he or she stacks the loaded trays, to a maximum of six high on the packing table shelf, after which they need storing on a nearby pallet at the rear of egg grader (the same technique used in full automatic egg graders). The Riva Selegg egg grader can be situated in-line to egg cross conveyor from cages or nests, or full automatic loading can be setup whereby a round table loader with eight trays with loader, loads 30 eggs per time onto infeed rollers into the machine. Riva Selegg egg graders have been available in Australia for 25 years and are distributed by Dunogan Farm Tech Pty Ltd. Rob Duns from Dunogan Farm Tech says Riva Selegg egg graders have proven egg grader technology, are compact in design and have the smallest possible layout footprint. The egg graders can be supplied with ink-jet egg stamping included.